Cale Holmes ’16, a member of the defense team, answers questions from the judges. 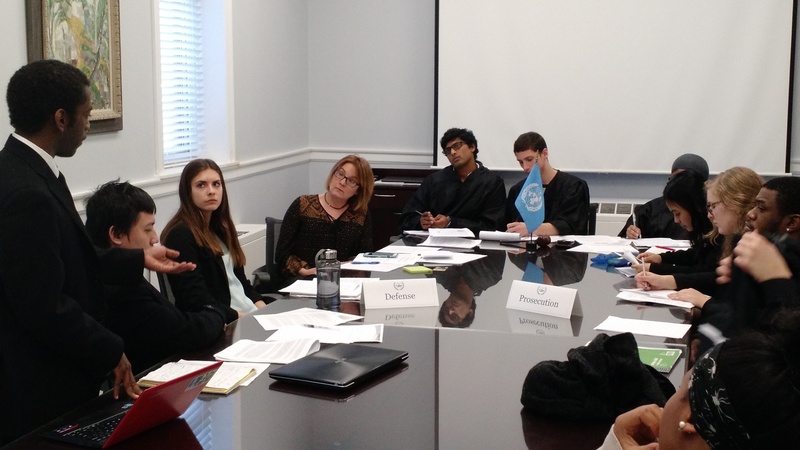 After a three-day pre-trial held on the Randolph campus, three judges ruled that there was enough evidence to continue prosecution of Colonel Igor Girkin in International Criminal Court. Girkin was allegedly connected with the downing of Malaysian Airlines flight MH17 near the Ukraine-Russia border July 17, 2014. After the ruling, the judges, prosecution and defense teams, and victims’ representatives chatted about the case and broke homemade bread together in Darden 1. All 11 involved in the case were students in political science professor Jennifer Dugan’s traditional end-of-semester court simulation. 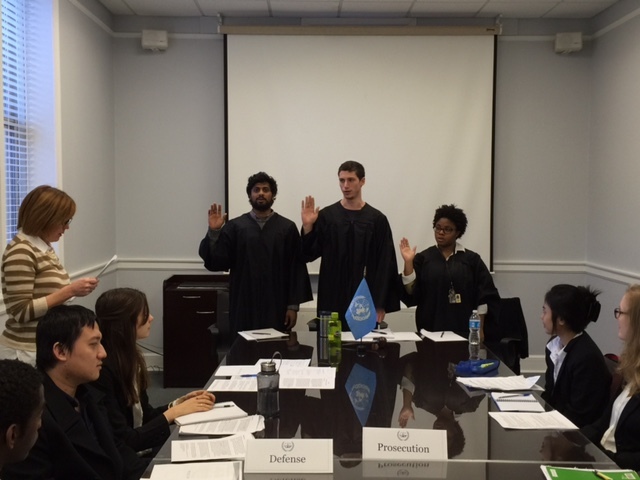 Judges (from left) Tahan Menon ’16, Donald Saltmash-Lubin ’16, and Vanessa McBean ’16 are sworn in on day one of the pre-trial. In preparation for the simulations, Dugan said some semesters she writes a script from beginning to end with hypothetical people, indictments, and countries. Other semesters, like this one, the cases are based on real people and real events. The real trial for Colonel Igor Girkin of the Donetsk People’s Republic Independence Movement has yet to happen. “We simulate the International Criminal Courts, as opposed to other international or regional courts, because it is the world’s newest court, is innovative in its approach to trying individual criminals, including heads of state, and builds in major ways on the precedent that the Nuremberg Trials set after World War II, including crimes against humanity,” she said. Since MH17 was traveling from Amsterdam to Kuala Lumpur, the simulation hit close to home for Eva Heitbrink ’17, who lived in the Netherlands when the incident occurred. She was a part of the prosecution team for the mock trial, and did research to find compelling evidence to convince the judges that the defendant was guilty of war crimes and crimes against humanity. One of the keys for the prosecution was proving that the case fell under the court’s jurisdiction, she said. 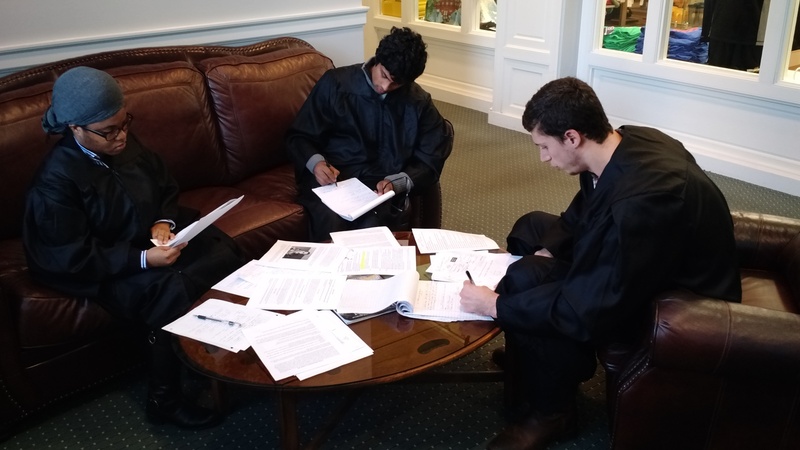 Donald Saltmarsh-Lubin ’16 was one of the three students clad in judges’ robes for the simulation. He said the biggest challenge in judging the case was remaining unbiased while also delivering a verdict that would allow the families of the 298 victims to have closure. The judges study all the evidence before issuing their final ruling. Saltmarsh-Lubin is a double-major in economics and political science, and is considering law school or graduate school as his next step.